Review | Information is power. In other words: if you know all the facts, you'll be successful. Kia saw at an early stage that SUVs would be popular. At the same time Kia realised that diesel was on the decline and alternative energy sources would gain in popularity. 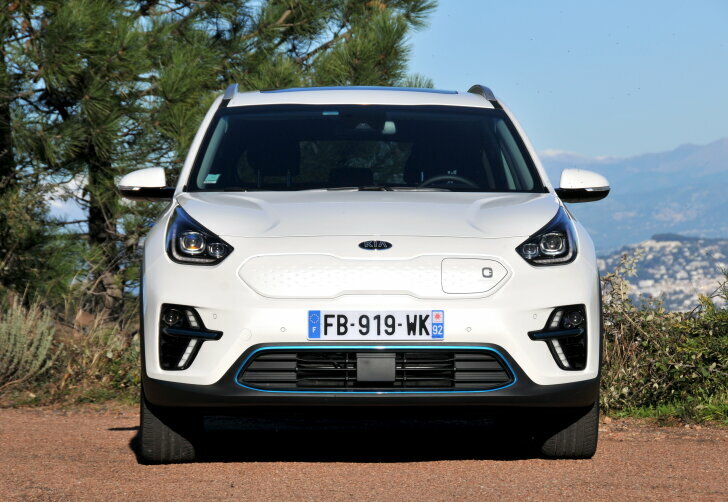 That's why Kia introduced the Niro Hybrid: an SUV that combines an internal combustion engine and an electric motor. 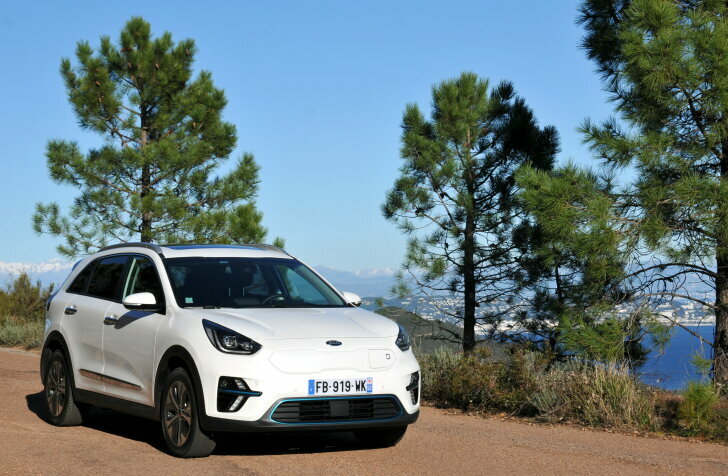 After this temporary solution it's now time for the next step: the fully electric Niro. By now, it's obvious that the future is electric. Electric cars aren't just more comfortable and more economic, to save the environment it's necessary to say goodbye to the internal combustion engine. Those who start developing an electric car now, are too late. Developing the technology isn't the problem. Finding a supplier for batteries is nearly impossible. All production for years to come has been sold out in advance. Kia predicted the switch to electric cars far in advance and closed contracts with suppliers (in this case: "SK Innovation") many years ago. At the same time, Kia developed a platform that would be suitable for various drive trains, to be able to gradually make the transition to new energy sources. That platform had to accommodate an SUV, because that's the other trend the Korean carmaker saw far in advance. The vision of Kia isn't limited to technology. It's about what the customer wants, not how technology is used to achieve that goal. The grille is closed, because an electric drive train needs (almost) no cooling and a closed grille improves aerodynamics (for less noise and more range). The blue accents on the bumpers make it clear that this is the electric Niro, but other than that the car looks average. The e-Niro isn't a futuristic vehicle that shouts to the world that things should be different. Because the e-Niro is an SUV, entry is easy and the seating position is a bit higher up than in a standard hatchback. The batteries required to power the electric motor are built into the floor, which means the cabin space is excellent. The e-Niro has been raised by 20 mm to create more (battery) space underneath the car. Space in the front is ample and even tall drivers sit comfortably thanks to the "gap" in the centre console. Space in the rear is good, but passengers cannot put their feet under the front seats. The boot measures 451 litres, which is average for a car in this segment. The exterior hardly reveals this is a special car and nor does the interior. Kia doesn't even follow the trend of replacing buttons by screens, which means even owners of older cars feel right at home in this hyper-modern Kia. Yet, the Niro offers all functionality one comes to expect from a modern car. The infotainment system is powerful and easy to operate. Optionally a high-end audio system from JBL is available, which sounds fairly good considering the price. The semi-self-driving functions do exactly do what they should do: assist the driver in dangerous situations and don't affect driving in any way. 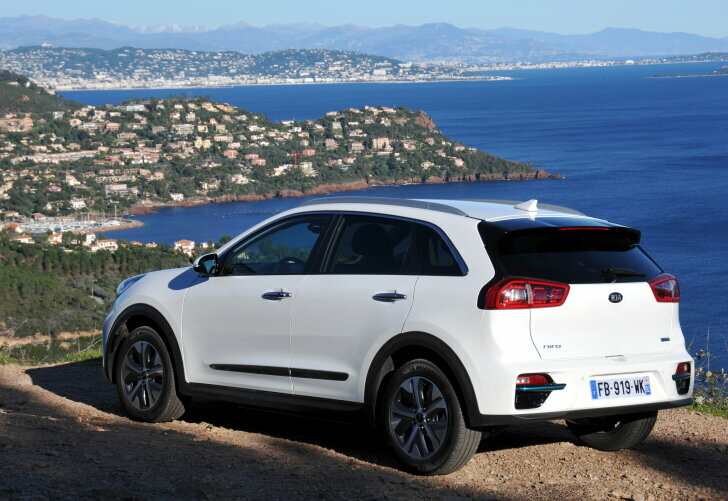 While developing the e-Niro, Kia kept objections against electric cars in mind. The most important of those is the limited range. That's why the e-Niro is available with a 64 kWh battery, which gives the car a range of 455 km according to the WLTP norm (a cheaper version with a 39 kWh battery has been announced). During the various test drives the actual range varied between 408 and 420 km. Those drives took place on difficult, demanding routes with mountainous roads (see photos) and heavy traffic. The e-Niro owes its efficiency to a smart drive line and an extra smart way to recuperate energy while driving. All electric cars turn kinetic energy into electricity when braking. Many electric cars allow the driver to decide how much energy is being gained when releasing the throttle, because more recuperation means more deceleration. This is why it takes some experience to do this right. The e-Niro makes things easier: it uses radar to simply measure how strong the cars in front are braking and adapts to them. In real life this works well, except for one situation: the radar can not see around corners and therefore in rare cases the driver had to brake manually. Other than that, the brake pedal was hardly touched over two days of driving. A large range isn't worth anything if the battery cannot be charged quickly. That's why the e-Niro can charge at a fast charger (direct current) at a maximum speed of 100 kW. In theory this means that the battery can be charged from 10% to 60% in just 31 minutes. At an alternating current charger (public charging point or home charger) this takes a lot longer because the e-Niro only handles 7.2 kW AC. On the other hand: the price per kilowatt is a lot lower at those places. Another con: the charging port is located on the front of the car and that forces the driver to park nose first, which is less accurate and more dangerous when reversing out. Because the battery is actively conditioned, it is always kept at the optimum temperature for quick charging and a long battery life. Also: at the right temperature a battery can deliver maximum power for excellent performance. In sports mode the e-Niro is almost comically fast. When pressing the throttle deeper, the nose slightly raises, the steering wheel needs be to held extra firmly and the heads of the occupants are smashed on the headrests while the e-Niro launches itself. When expressed in numbers the acceleration from zero to 62 mph in 7.8 seconds isn't too exciting, but the brutality and the might with which the e-Niro accelerates make it no less than spectacular. 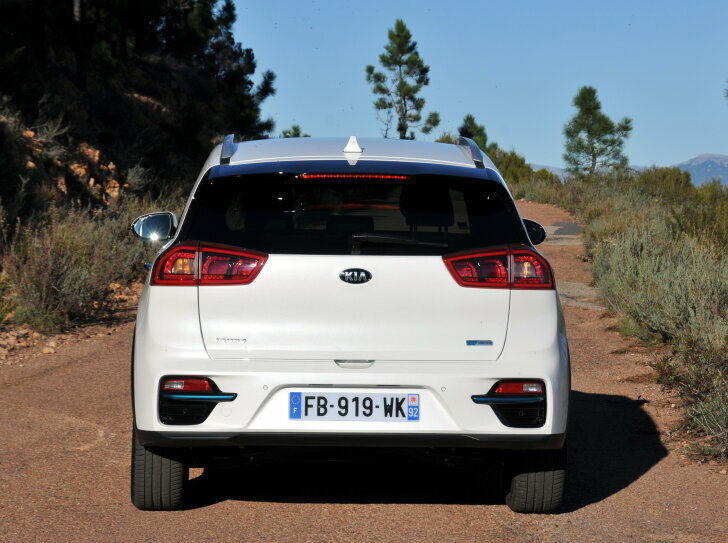 In its enthusiasm Kia forgot that an electric motor is much quieter than an internal combustion engine. That's why at very high speeds (> 130 km/h) noise from the tyres and wind suddenly increases; something that was never experienced in the Niro hybrid or plug-in hybrid, because in those cars the engine noise is most prominent. While the e-Niro is hyper-alert in sports mode, the standard mode and eco mode make for a quiet and comfortable ride. In these modes the e-Niro is easy to drive. Yet, despite the engine speed, there's always plenty of torque available for instant acceleration. Just like other electric cars the e-Niro lacks a gearbox and thus comfort isn't affected by any gear changes. The Kia e-Niro shares a lot of technology with the Kona Electric from sister brand Hyundai. Except for the rage in sports mode, both cars have the same response to the throttle. However, the Niro is larger than the Kona and this makes for different handling. Compared to the Hyundai Kona Electric the Kia e-Niro feels bigger and more mature. Because of the huge weight of the batteries, suspension is firm. Yet, when is comes to the finer details the e-Niro still offers plenty of comfort. Kia offers the right car at the right time. The e-Niro makes driving electrically so attractive, that there's little reason left to choose an SUV with an internal combustion engine. The e-Niro is quicker, more comfortable, has zero emission and is a lot cheaper to run. Charging takes more time than refuelling, but because electric cars are charged when not in use this is hardly an argument against them. The e-Niro distinguishes itself from other electric vehicles with a large range, excellent handling and quick charging (up to 100 kW) possibilities. The e-Niro is an SUV, which means lots of cabin space and tough looks. 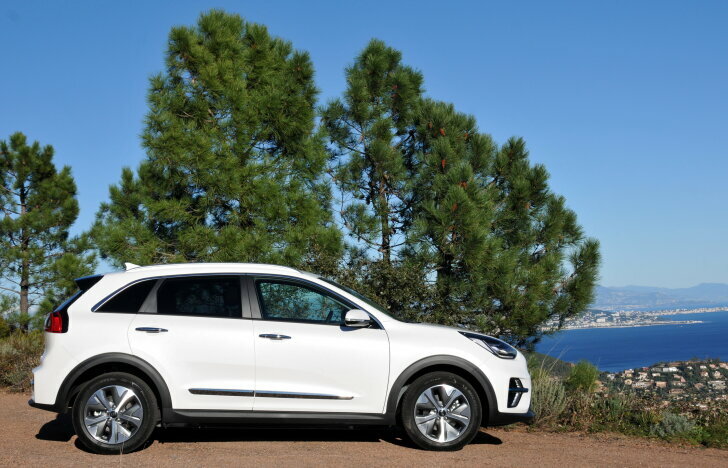 Knowledge is power and, with the e-Niro, Kia proved it knew exactly how the market would develop. The world of electric cars has a new leader and its name is e-Niro!